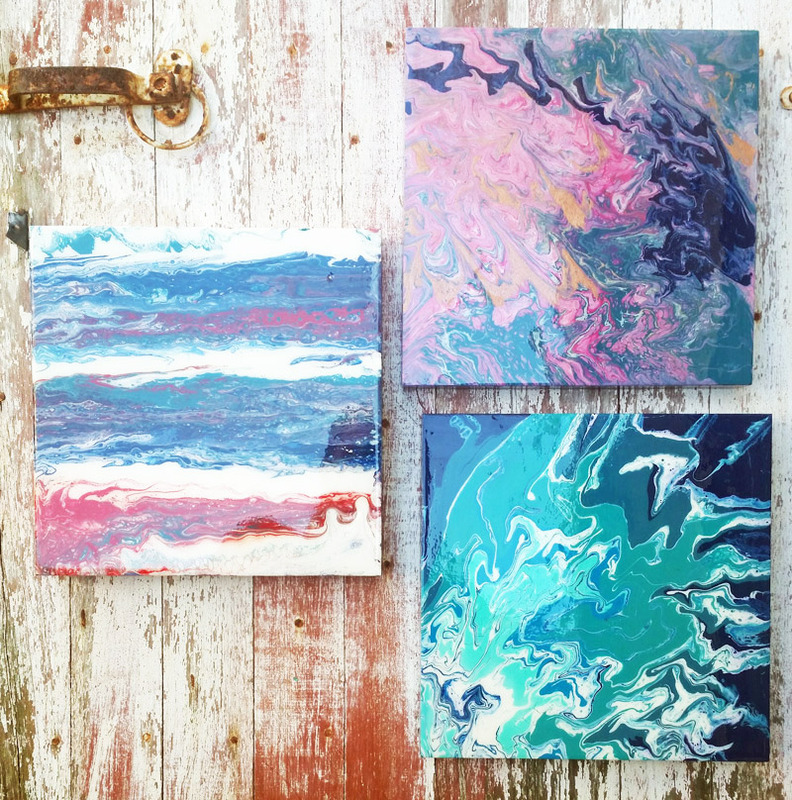 Fluid art with local artist & chemist Misti Schneidewind combines science and art to transform normal paint into mesmerizing designs. Workshops offered most Fridays. Call for class times. Read more. CHROMA’S December paint and sip class is now open for registration. 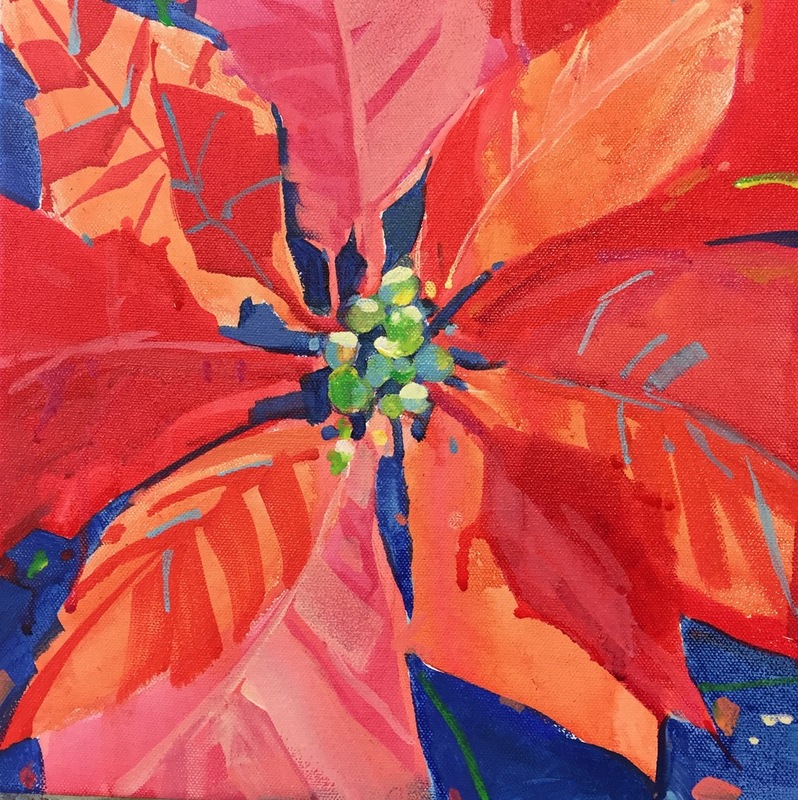 Paint “Point Washington Poinsettia” with Kathleen Broaderick on Thursday December 7th from 6:00pm – 8:30pm. All supplies are included including holiday cheer. No experience necessary. Food and drink are welcome. Click here to register. CHROMA is the studio and gallery of South Walton’s 2018 Artist of the Year, Kathleen Broaderick. 3925 West County Highway 30a, Santa Rosa Beach. 1-844–5-CHROMA. Creative classes for kids and adults at The Blue Giraffe are unique and fun…check them out and register at www.BlueGiraffe30A.com/classes. Learn to paint with complete freedom so it feels as natural as breathing. Local artist Aaron Sutton can teach you a simple formula that will erase any hang ups you may have about painting. You will learn to paint quickly, and with more confidence. Be prepared for a high energy rock ‘n roll art class! There will be only 4 students at a time to maximize personal attention. 16×20 canvas and all materials are provided. Bring ripped jeans (optional) snacks, water, caffeine (also optional) and a positive attitude. Pre-registration is required. Create a beautiful silk art scarf. 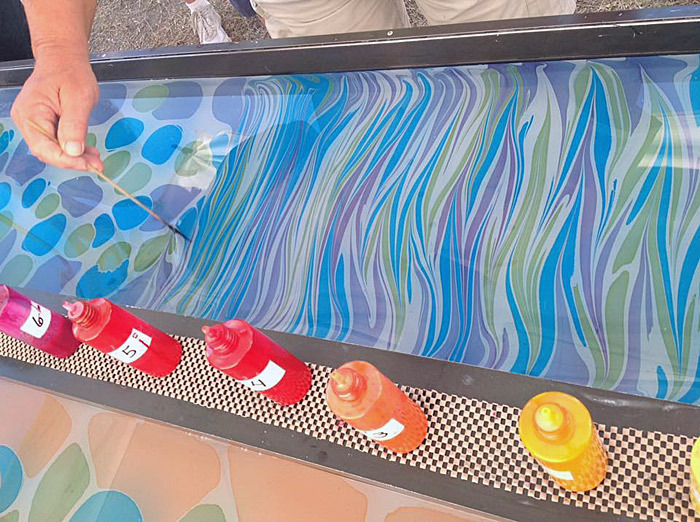 Ebru is the art of floating dyes onto a water surface and then using a stylus, stakes or combs to make intricate patterns with the dyes on top of the water surface. Artisans, Gary and Valerie, then stretch a 72”x14” silk scarf onto the water surface and the design is instantly absorbed by the silk. The scarf is then dragged off the water and rinsed in a water bath. The customer takes the scarf home in a baggie to dry. The designs can be simple and abstract, or more intricate, making chevron, peacock and other beautiful patterns. Either way, the scarf is always one of a kind! Drop-ins are welcome. 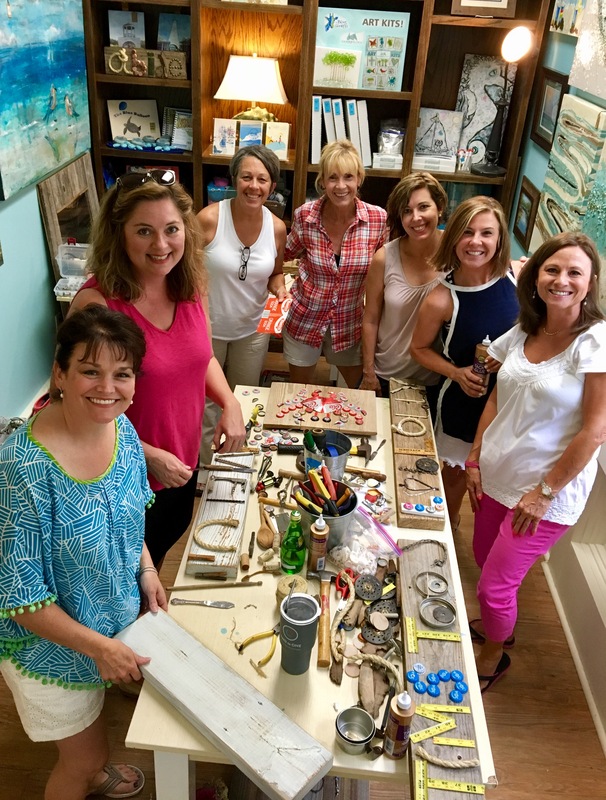 Join Tammy of The Moore Family Folk Art and make your own unique work of art from upcycled and salvaged materials. Choose from several different designed projects or create your own. Tammy will have all kinds of materials to choose from including weathered woods, antique metals, vintage soda cans, bottle caps, driftwood, and much more. Class fee is per person and includes as many art pieces as can be made in 2 hours! This is an adult class so feel free to BYOB. Pre-registration is required. 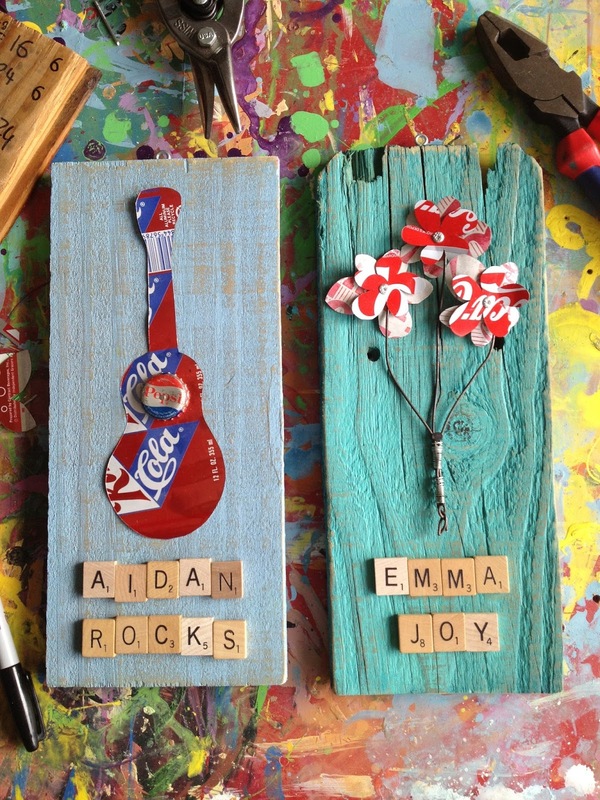 The Moore Family Folk Art team will help you create art using reclaimed wood, vintage cans, bottle caps & more. Our super creative teachers love showing you how to make cool new art out of old stuff! Our most popular workshop for kids and families to create memories they can take home. Rain or shine, on the front lawn or indoors if weather doesn’t cooperate. Walk-ups are welcome. Creative Classes are at the Blue Giraffe! The creative classes offered this month are Power of Journaling, Trash to Treasure and Paint Like a Rockstar. Author and Christian Life Coach, Miriam Ezell, will lead this class where you will learn the benefits of journaling, create your own journal that resonates with your soul, and practice journaling by answering powerful, thought-provoking questions. All supplies are included but feel free to bring meaningful cards, quotes and photos to personalize your journal. Class fee is $55 and pre-registration is required. Click here to sign up. Join Tammy of The Moore Family Folk Art and make your own unique work of art from upcycled and salvaged materials. Choose from several different designed projects or create your own. Tammy will have all kinds of materials to choose from including weathered woods, antique metals, vintage soda cans, bottle caps, driftwood, and much more. She’ll be there to guide you in this free flow workshop where you can make as much stuff as you want in the 2-hour class time! Class fee is $55 and pre-registration is required. Click here to sign up. Have you ever wanted to learn to paint with complete freedom? 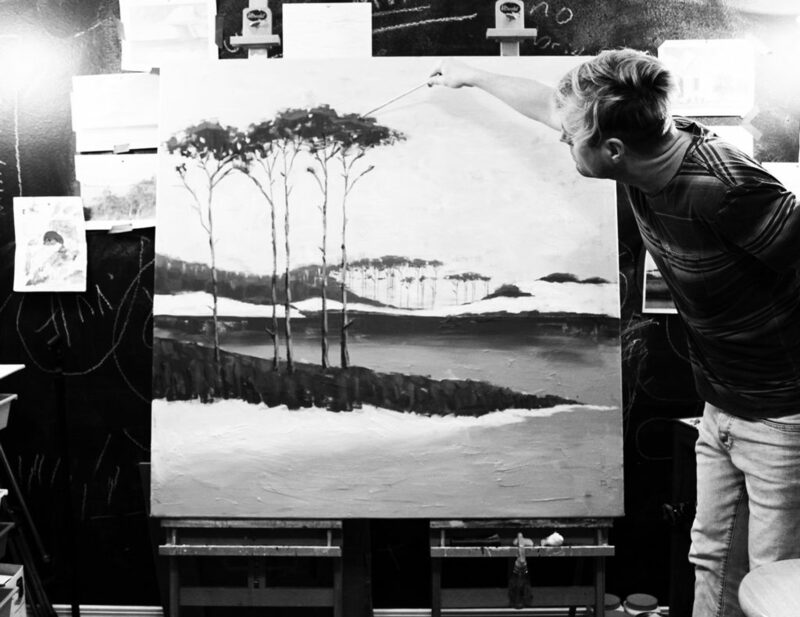 Do you want painting to feel as natural as breathing? The answer is by learning to paint like a rock star! Local artist Aaron Sutton (BFA, Texas Tech U.) can teach you a simple formula that will erase any hang ups you may have about painting. You will learn to paint quickly, and with more confidence. There will be only 4 students at a time to maximize personal attention. 16×20 canvas and all materials are provided. Bring ripped jeans (optional) snacks, water, caffeine (also optional) and a positive attitude. Class fee is $175 and pre-registration is required. Click here to sign up. 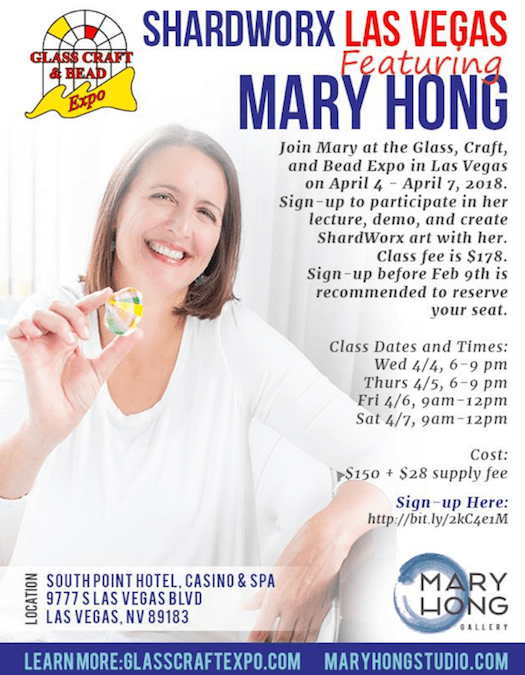 Upcoming classes at the Blue Giraffe! Guess what we did? Turned our bookroom into a classroom full of colorful art and happy vibes, where locals, 9Apps Apk Download Android and visitors can explore their artistic side. And, we’ve lined up some of our amazing artists to teach Creative Classes so they can share their techniques, artistic passion, and big hearts with you.